Organized by the Partnership Platform for the Amazon (PPA), the 1st Impact Investing and Sustainable Businesses Forum in the Amazon (FIINSA, in Portuguese) ended this Wednesday (11/14) with a business round that will disburse R$1.1 million in accelerating four small sustainable businesses based in the Amazon. 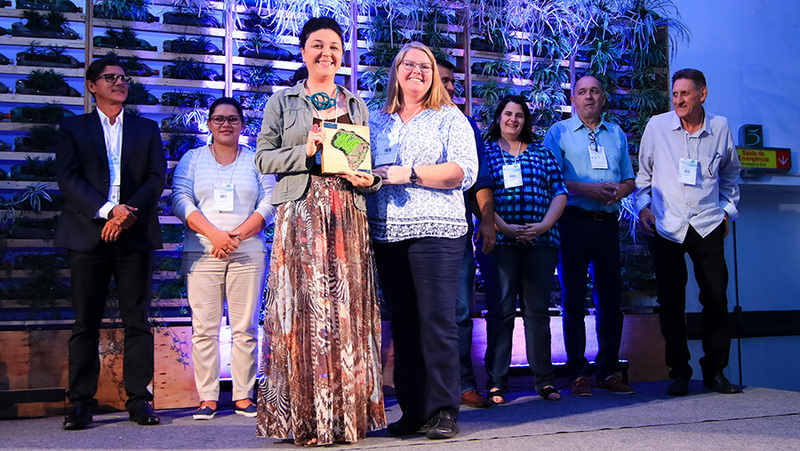 Four other businesses received the PPA Award, each receiving an investment of R$60,000.00 to boost their activities: Sustente, Onisafra, Da Tribu and Broto. The event gathered major companies, investors, NGOs and entrepreneurs from the Amazon states and hosted a shark tank in which the representatives of four companies selected among over 80 faced the challenge to introduce their businesses in only 5 minutes to investors (‘sharks’) such as Sitawi, Nesst, Conexus and Bemol. >> Get to know more about the business selection carried out by PPA and Pipe Social. In addition to presenting live their businesses, the entrepreneurs from ‘Encauchados de Vegetais da Amazônia’, ‘Manioca’, ‘Peabiru Produtos da Floresta’ and ‘Ração+’ had to answer the questions the sharks made – which were quite detailed. They wanted to know about growth plans and how they could enhance their socioenvironmental impact. After the negotiation round, the entrepreneurs left the stage happy and acclaimed by the audience. Joanna Reis, founder of ‘Manioca’, that works with high quality food, was thrilled to receive the investment: “There is a whole history until I get here. Thank you very much. I can promess that the entire Manioca team will be pretty focused in working on this”, she said after getting the R$200 thousand investment proposal. Among the challenges that were pointed out, there are: (1) little availability of capital for impact investing, (2) the need for public policies that meet the demands from the region’s productive communities, (3) qualification associated to research and development, (5) the need for greater connection between the actors of this ecosystem, (6) logistics and infrastructure, (7) violence in rural areas, (8) the need of changing the entrepreneurship culture in relation to livestock and timber and (9) leveraging more businesses in the “Amazônia Profunda” (Deep Amazon, in English) open call involving more traditional communities. The opportunities include, (1) growing public willing to consume products that are related to the Amazon brand, to sociobiodiversity, and biodiversity conservation, (2) new resources and financing models arriving, (3) a new generation that takes businesses having these issues in mind and open to change. “Making an event like FIINSA in Manaus is really important. Usually, events of this nature are held in the southeast or in Brasília. This Forum introduces an agenda that should become increasingly lasting and contribute more and more in order to assure that impact investing and sustainable business have the conditions to develop in the Amazon”, states Mariano Cenamo, Idesam’s senior researcher and general coordinator of the Forum. The Amazon is responsible for less than 8% of Brazil’s GDP, and impact businesses can help changing this landscape and also protect the forest. What won’t be possible without improving the lives of those who live there. During the FIINSA, that took place in November 13th and 14th, over 290 people from different states of the Amazon got together to debate impact investing and business in the region, looking for connections between actors from this ecosystem: entrepreneurs, investors, accelerators, incubators, companies, institutes, foundations and the academy. All with the same purpose of fostering and leveraging businesses focused in the promotion of sociobiodiversity in the conservation of biodiversity, involving traditional communities and seeking new paradigms for the sustainable territory development. 80% of the attendees came to Manaus in search of connections and networking, and over 50% have already made business in the Amazon. FIINSA’s next edition should take place in 2019 or 2020 and, until then, the challenge is to keep the connections permanently to strengthen the field. Also during the FIINSA, the study “Impact Investing in the Amazon – Paths for the Sustainable Development” was launched. It identifies the investing mechanisms, types of enterprise, value chains, obstacles and opportunities for investments in the region. “New actors must be attracted. They need to be more down-to-earth when dealing with the region’s specificities”, explained Leonardo Letelier, from Sitawi, that carried the study out. Investors want scale, value, technology, innovation and impact. Besides, obviously, financial return. For entrepreneurs, what matters is the commitment of who invest with the new business, as Laurent Micol, from Pesca (specialized in recovering degraded pastures and promoting sustainable cattle-raising in Mato Grosso state), explained: “We get things going, we want to make something great with the indicators the investor demanded. But if we could start over, we would do half of 10 thousand hectares that we have today, twice as fast”. The Amazon brand was also reminded as a great opportunity, but Raphael Medeiros, executive director of the Centre for Entrepreneurship in the Amazon (Centro de Empreendedorismo da Amazônia, in Portuguese) highlights: “the products need to be well packed and have certification. Due to the distance, they arrive more expensive to the market, but the focus must be the socioenvironmental impact and the quality that is delivered to the consumer”. After multiple cycles of natural resources exploration that didn’t leave wealth, “it is clear that the pat to take is of the fair trade, with positive impact on forests and people”.